Potente y seguro software de recuperación de datos. 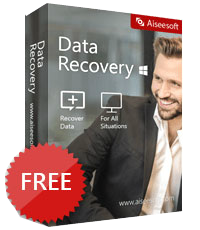 Aiseesoft Data Recovery es el software de recuperación de datos potente y seguro. Puede ayudarlo a recuperar casi todos los archivos eliminados / perdidos, como fotos, documentos, correos electrónicos, audio, videos y más desde el disco duro, la unidad RAW, la unidad flash, la tarjeta de memoria / dispositivo en la cámara digital o el teléfono móvil, y más. Si perdió datos debido a la eliminación accidental, el bloqueo del sistema, el formato, el daño o si extraña los archivos para la reinstalación del sistema, el ataque de virus, el clonador incorrecto, etc., puede utilizar esta utilidad de datos profesional para restaurar los archivos con unos simples clics. Aiseesoft ofrece 50% de descuento en el código de cupón: AISESUOD (se aplica a los productos recomendados y otros productos)para todos los usuarios de GOTD. Now get it with 50% OFF Coupon: AISESUOD for all GOTD users. Aiseesoft FoneLab is the most reliable iPhone/iPad/iPod data recovery software. It allows you to retrieve the deleted text files (contacts, text messages, call logs, notes, etc. ), and lost media content (photos, music, videos, etc.) from iOS devices directly. In addition, it lets you restore iOS data from iCloud or iTunes backup. Completely compatible with iOS 12, it does a great job in backing up latest iPhone XS/XR/X, iPhone 8, iPhone 7, iPhone SE, iPhone 6s/6s Plus, iPad Pro and iPad mini 4 on your computer. 1. In its latest upgrade, this software gets 3X faster of scanning speed and highly support Kik and Line messages recovery from iOS devices. iOS Data Backup & Restore: which makes the one-click backup and restore for your contacts, messages, call history, photos, calendars, reminders, voicemails, WhatsApp messages, etc. without iCloud or iTunes. Now get it with 50% OFF Coupon: AISESUOD for all GOTD users. Aiseesoft Android Data Recovery is the data retrieval software for Android phone and tablet. It recovers deleted contacts, messages, call log, WhatsApp messags, photos, notes, and other media files from phone and SD card directly. In the latest update, it enables you to fix your system crashed phone (froze, white screen, down, etc.) to normal, and extract data from broken phone (password-forgotten, screen-smashed, etc.) to computer safely. What’s more it adds new feature to backup data (contacts, messages, call logs, gallery, videos, audio and documents) from Android phone in one click and restore the backup to phone directly. Now get it with 50% OFF Coupon: AISESUOD for all GOTD users. Aiseesoft MobieSync is the iOS data helper to transfer, convert and manager photos, videos, contacts, and others easily. It works as the data transfer to copy files from/to iOS device to/from computer, and between iOS devices (iOS 12 supported). Moreover, it lets you convert HEIC images from your iPhone to be viewed on more devices that are playable conveniently. You can even customize ringtone for your iOS device without purchasing from iTunes Store conveniently. Get the all-in-one data transfer, HEIC converter and ringtone maker, and you can play your iOS device at ease. Now get it with 50% OFF Coupon: AISESUOD for all GOTD users. Aiseesoft Video Converter Ultimate is the most professional multifunctional video utility. It converts video and DVD to other format (MP4, MOV, AVI, MKV, FLV, etc.). It also supports converting video resolution among 4K, HD and SD to meet your needs. Its powerful editing functions enable you to edit special video effects and rotate sideways video. It also enhances your video quality by upscaling video resolution, optimizing brightness automatically, remove videos noise and reduce video shaking. You can add/delete/change the subtitle or audio track for your video file to get what an ideal that you want. Now get it with 50% OFF Coupon: AISESUOD for all GOTD users. Aiseesoft Slideshow Creator is the easy-to-use video weaver with photos, videos and music files in high resolution (4K supported). It makes slideshow movie with BMP, JPG, JPEG, PNG, TIF, TIFF, ICO, DIB, JFIF, EMF, GIF, MP4, FLV, WMV, MTS, AVI, MOV, MP3, AIFF, FLAC, AAC, AC3, WAV and more. You can create a quick movie with the ready-made themes, and customize slides by combination of text, filters, transitions and elements freely. Adding background music/subtitle and editing video (crop, clip, rotate, mirror, fast/slow motion, crop, etc.) can be supported fully. Note: This software is compatible with Windows computer on 64 bits.